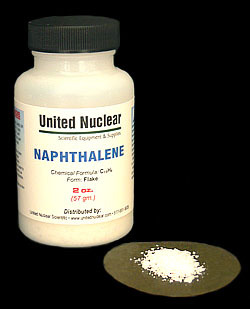 Naphthalene is primarily used as a chemical intermediate to produce other chemicals. The largest uses are in the manufacture of Antiseptics. Naphthalene sublimes (converts directly to a vapor) at room temperature. A novel product made with Naphthalene is Rattlesnake repellant. It consists of a mixture of Naphthalene and Sulfur which according to the manufacturers, throws the nervous system in snakes into a frenzy - doing whatever they can to avoid the area where the material is applied.